Planting in straw bales offers an way to grow healthy plants for gardeners with poor topsoil or insufficient space for a garden. When you plant tomato plants in a bale, it saves the back from bending over and you'll only need to weed occasionally. While straw bale gardening requires heavy feeding with fertilizer and frequent watering, you may find that the advantages of planting in a straw bale will outweigh the disadvantages. Choose firm, well-tied straw bales. Tight and compact straw bales will hold up and stay intact during the tomato growing process. Avoid straw treated with herbicides, because this can interfere with the health of a growing tomato plant. Place the straw bale on flat ground in an area that receives full sun. Use plastic sheets under the straw bale to help conserve water. Water each straw bale with 1 gallon of water daily for two weeks. An optional step is to cover the straw bale with plastic after watering. This will minimize water evaporation off the top of the bale. Spread 2 1/2 lbs. of fertilizer on each straw bale after watering for 14 days. 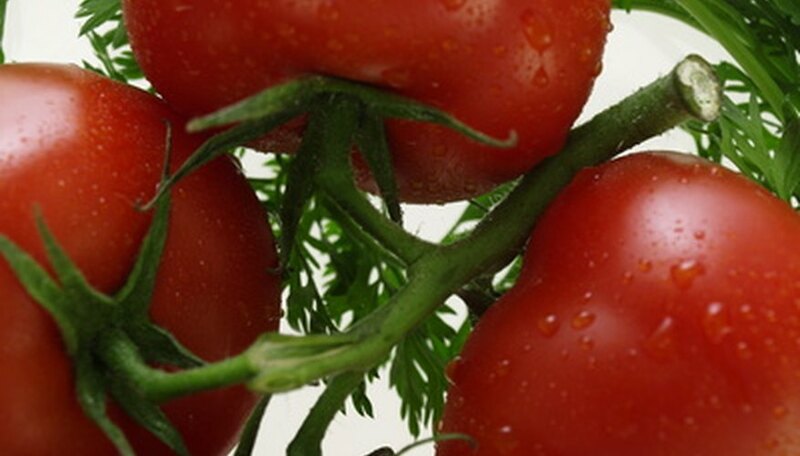 Use a tomato fertilizer mix of 5-10-10 (nitrogen, phosphate and potassium). Spread the fertilizer on top of each bale, and work it into the straw slightly with a small trowel. Continue to water each bale daily with 1 gallon of water for seven more days. Check the internal temperature of the stray bales to prepare for planting the tomato seedlings. Before planting, make sure each bale is under 100 degrees F. Use a stick to test if no thermometer is available. Insert the stick in the center of the bale and leave it there for a hour. After removing, test to see if the stick is only slightly warm. Check on the temperature daily, until it cools enough to be under 100 degrees F.
Spread a 5-inch layer of soil mix on the top of each the straw bales as a top coat before planting. Plant two tomato seedlings per bale. Dig a hole in the straw, place the seedling and fill in around the roots with the loose straw and dirt. After planting, use stakes or cages for each tomato plant for support. Continue to water daily to keep the straw bale moist. Fertilize every two weeks after planting with 1/2 lb. of fertilizer per bale. Keep up with this routine until the end of the growing season. Pick straw bales made from wheat, rice or barley for best drainage. Straw bales may attract slugs. Living in Maine, Sarah Conant has been writing since 2009. After spending 10 years in the field of horticulture, Conant specializes in landscape design and gardening. She attended Southern Maine Community College for plant and soil science.